Dexter Daily: Michael C. Hall Talks Season 7, Six Feet Under and More: "Dexter Is An Idea"
Michael C. Hall Talks Season 7, Six Feet Under and More: "Dexter Is An Idea"
New interview with Michael C. Hall, via bendbulletin: As embodied by actor Michael C. Hall, Dexter not only harbors an evil side, but a benevolent one. 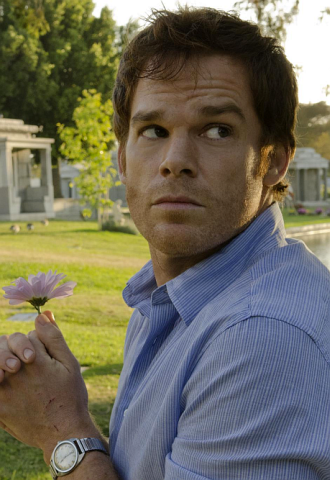 Combining the opposites is what makes Dexter fascinating to watch and to portray. “Dexter’s a vexing character," agreed Hall. “In some ways I feel like he’s a person who could never be; he’s an idea. It’s implausible to think that someone could pull off what we’re invited to believe he’s pulling off. So that’s tricky. And you can’t really spend too much time thinking about logistical implausibility. (You must) let it work on a more symbolic or metaphoric level." Just accepting the creepy role was an act of valor. Hall had just come off playing gay mortician David Fisher in HBO’s “Six Feet Under." He was severely cautioned against both roles. “It’s not like I looked at every other part that was available for an actor on television and decided, ‘You know, I think I’ll play David Fisher.’ It just came across my desk. And when I read that script for ‘Six Feet Under’s’ pilot, I had the sense I knew how to do it," said Hall, 41. “Because he was a gay character — and this was back in ’99 — when I auditioned there was a sense, ‘You’re going to be pigeonholed. You’re going to shoot yourself in the foot.’ I heard that, but the question I asked myself was, ‘Well, am I an actor or not? This is as complex a character and rich an overall world as any I’ve read in any play, television script or new film script that I’ve seen. If there is some issue of typecasting or hamstringing myself, I’ll deal with that.’"
A short time later he and his second wife, Jennifer Carpenter, divorced. Ironically she plays his adoptive sister in “Dexter," and they continue to work together on the series. “It’s a challenge, I won’t pretend it’s not a unique and unprecedented dynamic that exists for both of us in our relationship," he admitted. “I think we both actually take a lot of pride in the way that we maintained our professionalism, our commitment to one another, our commitment to the characters we’re playing in the show. It’s certainly a lot more interesting than we anticipated going in." Though he confesses that he sometimes feels unequal to the task, risk taking has been part of his life. For that he credits his mother. His father died when he was 11. He was an only child and his mother supported him as a teacher, guidance counselor and eventually dean of students. “I think my mother has everything to do with everything that’s strong about me," he said.